When we planned travel to Thailand, we had no idea that the king’s five-day funeral would coincide exactly with the dates of our visit. Our initial disappointment (because we read that many famous sites would close and the city would be unusually congested) dissipated when we very quickly realized the rare cultural opportunity we’d been given to observe the Thais as they buried their beloved king. It’s important to point out that I do not use the words “beloved king” flippantly. Every Thai person we encountered, from taxi drivers to tour guides to convenience store clerks, expressed authentic sorrow that the time had come to lay their leader to rest via the extremely elaborate cremation ceremony. 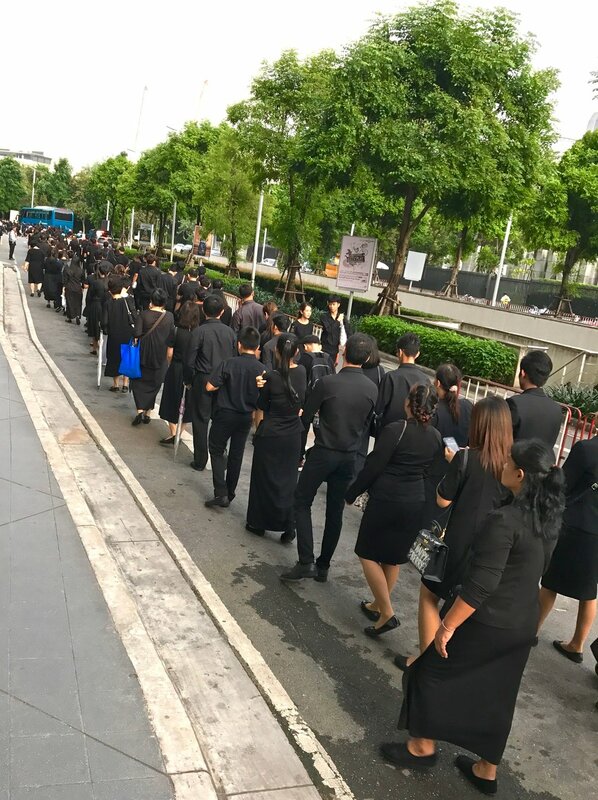 Thousands wait patiently outside of Center World (the tenth largest shopping complex in the world) to pay homage to King Bhumibol Abulyadej on cremation day. Having been head of state for 70 years, “Rama IX” was one of the longest reigning monarchs in the world. This means that the majority of Thailand remembers only “Number 9” (as he is sometimes affectionately called) as the head of state. Before traveling to Thailand, we read many warnings about doing or saying anything that would reflect negatively on the king. For example, if we were to drop a Thai bhat on the ground and should it begin to flutter along in a breeze, under no circumstances were we to run after it and then step on it to stop if from blowing away. Why? Because to step on the currency would be to step on the image of the king—an offense that could land us in jail! It’s also probably a good time to mention that Thai law literally forbids its people from writing or uttering words that could in any way “defame, insult or threaten” the king and/or any of the royal family. In fact, breaking this “lese majeste” law carries with it a minimum 3-year and a maximum 15-year prison sentence. So it follows, then, that the Thai people would share only favorable remarks concerning the late King Bhumibol Adulyadej, right? I’d agree with that sentiment to an extent. Because sure, a potential jail sentence likely deters political rants in a public forum. However, when asked about the new king—“Number 9’s” son—and how he is doing in his father’s footsteps, great hesitation and/or silence ensued. All who used words carefully chose them, and no one said anything damaging or remotely negative. But their hesitation spoke volumes. However, when speaking of the late king, enthusiasm immediately abounded. The Thai people both wrote and spoke extensively about Rama IX. We learned of how he studied science to help the farmers in his land to not only survive but to thrive during times of drought by increasing water reservoirs. We heard of how he “truly loved his people” and of how he would “mingle with” the people of the land, no matter how poor. Indeed, we saw many photos of the king mucking through mud to get to areas of national disaster. I read of one person who loved how his king did not wear a crown or jewelry, but instead carried a pencil, a map, and a camera. The majority of billboards in Thailand featured tributes to "Number 9." Thousands of Thai mourners line up here in the Ratchaprasong District for the opportunity to offer sandalwood flowers in homage to the king. 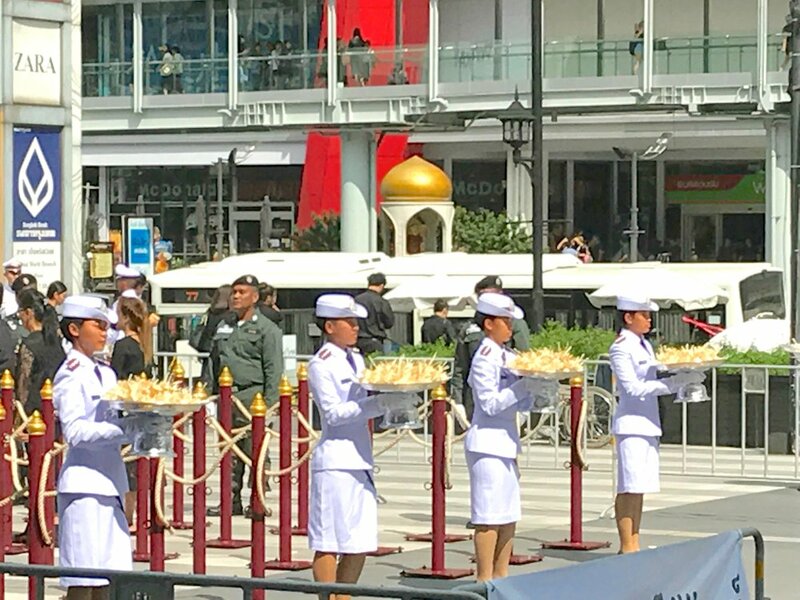 Uniformed men and women ensure a reverent and organized ceremony for thousands of mourning Thai people who loyally present sandalwood flowers (see the flowers on the large plates) on the day of the king's cremation. While it’s true that we left Thailand without having seen The Grand Palace or The Emerald Buddha, we did walk away with a real life understanding of the beautiful impact a servant king has on his people.